Book from: Borrowed from C.
Alison Bechdel opens her tragicomic memoir by casting her closeted gay father as Daedalus, artificer of the labyrinth that enclosed their family’s lives, and somehow complicit in her own, Icarian “downfall” – her eventual realization that she was a lesbian. The labyrinth was for me the ideal opening image: I found Fun Home hypnotically meandering, manically meticulous in its assemblage and arrangement of cryptic, resonant details. It’s claustrophobic yet internally expansive in its explorations of space, and meaning. The last book that I read that wove together myth, history, and family with such complexity and vitality was Middlesex, which I found a thrilling read – but there’s a particularly sharp, human poignancy to Fun Home because you know that this is a real person looking back at painful, incomprehensible events – the core and substance of her own life – and making something rich, strange, and uncannily beautiful out of all of the intersections and patternings of father and daughter, family and art. It’s dark, spooky stuff – close reading as divination, intertextuality as invocation. I identified so much with these elements of Alison’s personality: the recourse to narrative and archetype for “explanatory” patterns, the generally obsessive analytical bent. And, of course, the universal family dynamics – the struggle of a child to define herself against or around what her parents want, against what her parents represent. Here they’re shaped with particular sharpness by the fascinating inverted gender dynamics between her and her father. I’m haunted by the strangled potential of the one direct conversation that Alison had with her father, shortly after her coming out and only weeks before his death, about his homosexuality. He admits that he wanted to be a girl when he was little, that he wanted to dress up in girls’ clothes. And Alison leaps in to remind him how she always wanted boys’ clothes, hiking boots and short hair, when she was little. She does this with painful eagerness (how could he have forgotten? ), hungry for the moment of identification and closeness, hungry to bring together their reflected selves to a rare point of convergence. By the end of the novel, I felt incredibly tender towards both Alison, and her father. As much damage as he did, his story is heartbreaking. I can’t help but hope that he would have found Fun Home a fitting tribute. As my tribute to Fun Home, I’ve posted a full (and partially annotated) list of all of the books mentioned or read within its pages here. 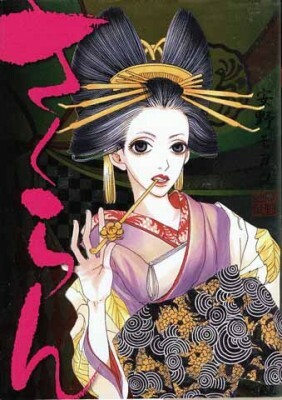 I expected Sakuran to be fun – racy, rambunctious, ornate. Brothel life in Edo-era Japan, oh yeah. And it is fun, sort of – bubbling over with scheming, ambition, spectacle, and biting exchanges of emotional violence. But it’s also deeply, and more lastingly, sad. Kiyoha is fifty times the usual feisty protagonist: she’s crass, arbitrarily malicious, and often outright violent. While this can all be amusing, even admirable, it’s also a disturbing, straightforward statement about the molding influence of a system founded on mistrust, competition, and the basic cruelty of buying and trading young women. Sure, Kiyoha might just be a queen of cats by inclination, but we also bear witness to the events that progressively eat away at her humanity, at her willingness to trust and share and be kind. The courtesans’ lives are haunted by a desperate craving for love, and by its impossibility. If I recall correctly, only one of the girls eventually marries her favorite patron; the rest are fated to disappointment, or even death, at the hands of patrons, or their own desperation. The manga culminates in a quiet emotional ruin: in a few pages, we see Kiyoha – at the ripe age of twenty-something – eaten completely hollow by love’s casual betrayal. Sakuran is an anti-romance, in other words. While I have nothing but praise for Sakuran‘s emotional daring and honesty, there are several practical stumbling blocks to enjoying the manga. Moyoco Anno draws only a veeeery narrow range of facial features, so it’s nearly impossible to distinguish the oiran (and many of their patrons, too) except by their wardrobes. Flipping frantically between pages to double-check which girl with what dialogue bubble had the kimono with the crane pattern and not the peony pattern and these hair ornaments not those hair ornaments, was about as fun as it sounds – and then you get to do it all over again as soon as the scene changes and everyone’s wearing different clothes! Which happens often, since the manga drifts from vignette to vignette, with little connective tissue. This works to create a sense of drifting and dislocation, of the oiran existing in an unmoored twilight realm whose essential drudgery is punctuated by episodes of bizarrely heightened emotion. But my god, it wouldn’t have hurt for everyone to look a little bit more different, would it? Still, the underlying substance of the manga is so very excellent that it more than made up for all the practical distractions; I look forward to the added fluency of comprehension that a reread will bring. If you didn’t like Memoirs of a Geisha (I didn’t), or maybe if you did, too, but are ready for a more hard-bitten take on the courtesan-memoir, I strongly suggest you give Sakuran a try. I’ve been doing some thinking this spring about figuring out reviewing practices, or a mindset, that don’t have me regularly consuming 3+ hours for writing and headscratching that I meant to have done in one, doesn’t give me hives, and generally achieves a higher fun/stress ratio. We’ll see how this goes. Oh Saga! 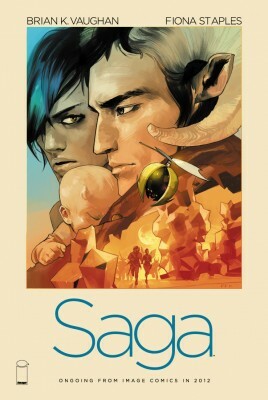 Brian Vaughan and Fiona Staples’ Saga is so much fun that I can only assume that if you like fun, you will like Saga. It seems like Vaughan set out to create an X-rated Star Wars in comics – galloping galactic conflict in an expansive science-fantasy universe, plus some very colorful violence, and equally colorful sexytimes wherever characters seem like they might want or need to have ’em. But its immense irreverence has me reaching for Firefly as the easiest comparison. However, the humor feels less strained to me than Firefly‘s. (The ticking of Joss Whedon’s brain behind the goings-on, working at being quirky or heartrending or whatever, is often too loud to me.) 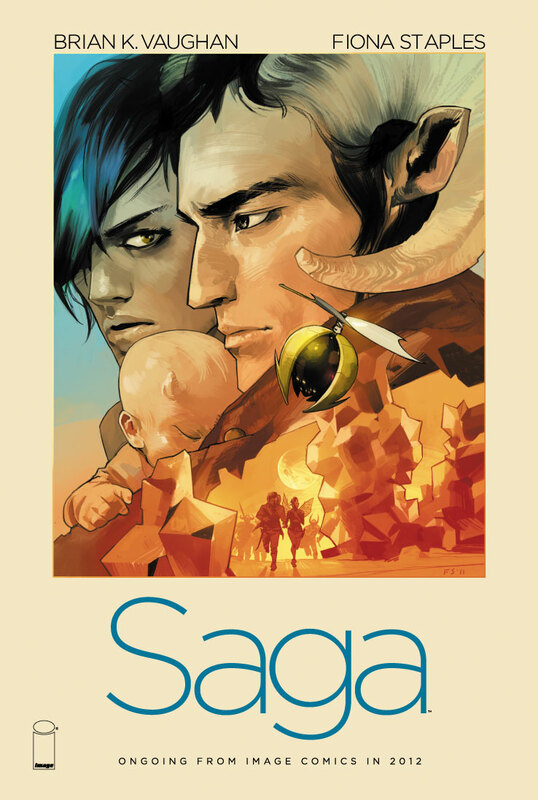 This is helped along by how boundlessly, weightlessly, beautifully weird the universe of Saga is. 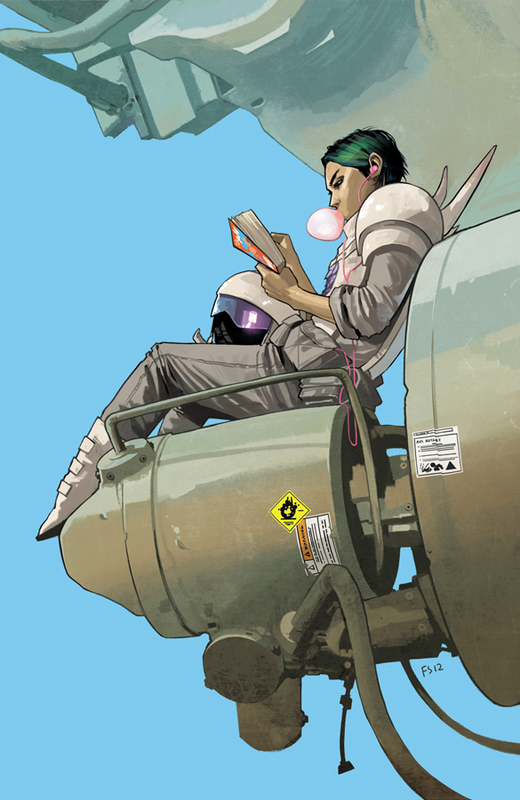 Alanna and Marko are Romeo-and-Juliet runaway soldiers and new parents – much of the emotional weight of the comic rests in the anxieties of parenthood; the star-crossing romance seems forgettable by comparison. Their getaway ship is an enormous tree powered by personal sacrifices. Their babysitter and guide is a bisected ghost-girl (whose choice in headgear and allover pinkness reminded me of Runaways‘ Molly). Their pursuers include a TV-headed robot prince who just wants to get home to his recently pregnant wife, and a taciturn uber-mercenary with relationship hangups and a puma-sized, lie-detecting hairless cat. And given that all of the characters, even those that only appear for a few panels, are believably animated by a cantankerous, stubborn humanity, none of this feels like a burden of whimsy on the reader’s patience; I moved to greet each new surprise with incredulous laughter, and greedy eyes. Fiona Staples (check out her sketchblog here) paints lushly, lushly, with a palette heavily reminiscent of the cool, dreamy neons of, naturally, 1970’s sci-fi – the soulkillingly garish bordello planet where The Will (aforementioned mercenary) makes a detour put me in mind of Bespin’s Cloud City, on acid. Much of the imagery is clearly, simply meant to make the reader pause, and feel the uplift of wonder; I did plenty of that. Oh, those panels of the ship-tree drawing itself together to jet through space; oh, the towering beasties and haunted blue-green woods and luminous mountainscapes. I am grateful that this comic exists, and am going quietly insane until the second trade comes out (July 2!). Read the comic online here. “Once upon there lived a prince in a palace. Apologies for the utter deadness around here lately; Kakaner is fiendishly, horrendously, unspeakably busy with a very exciting new job, and I’ve been occupied trying to not get kicked out of wildly succeed in my graduate program. But here’s another round of gender-subversive fun for fans of Revolutionary Girl Utena, and anyone whose interest was piqued by my review of Osamu Tezuka’s Princess Knight: Katie O’Neill’s gently goofy and heartfelt new webcomic Princess Princess, in which a dashing princess errant is the one to rescue a tower-immured damsel. 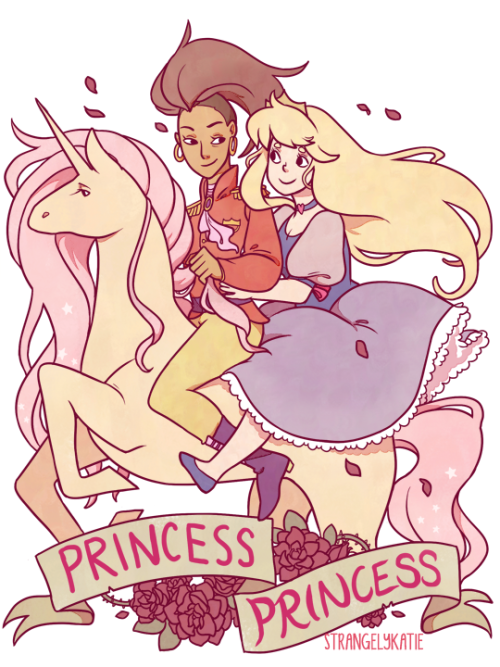 Princess Princess updates once weekly, and is predicted to run up to 30 or 40 pages. You can also find additional art and bonus comics over at its Tumblr. 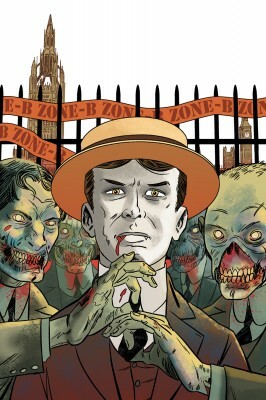 I know the universe loves me because there’s a new comic called The New Deadwardians, and it’s about vampires, zombies, and class conflicts in alternate Edwardian England. I saw the first issue (from March of this year; there are to be 8 issues total) still hanging around in a comic store, picked it up, read it as soon as I got home, and wished I had bought the rest. 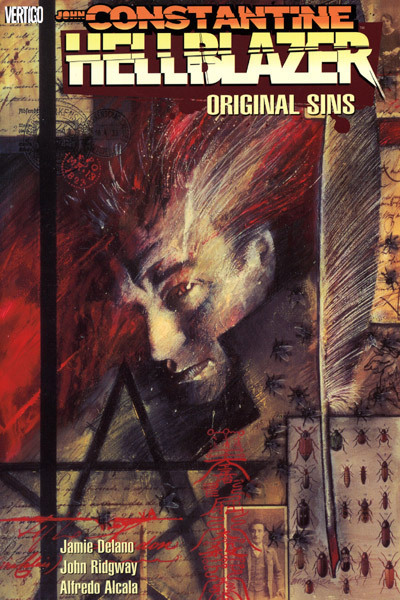 The cover art gives away the punchline, though the first issue never says it outright: the English aristocracy have embraced vampirism – “the cure” – in order to escape the zombified lower classes. (It’s not clear yet what’s happened to the rest of the world.) As Twilight literalized class (and race) conflict via Bella’s choice between sleek, chilly, uber-white vampires vs. rough-n-tumble, blue-collar, Native American werewolves, so Deadwardians does with poker-faced pish-posh vampires vs. sloppy Cockney zombies. Caught in between are living servants, police officers, and other members of the working class, who also appear distantly as angry unionists demonstrating against the military zoning of London. 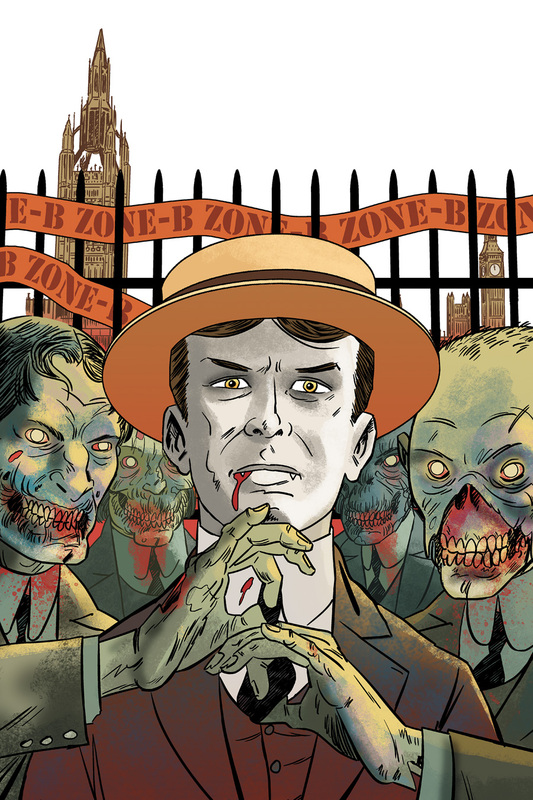 The undead – and presumably some living survivors – have been pushed back beyond “Zone B,” and hence are referred to as Zone-B’s. Har de har. I also winced at the use of “Deadwardian” in the comic itself – it’s too cutesy to be believable in-universe. Luckily, it’s the only false note struck in this issue. The protagonist is George Suttle, a vampirized detective afflicted with some degree of existential angst, and a pruny mum who should appeal to fans of Maggie Smith as the dowager duchess in Downton Abbey. The end of the issue sees Suttle confronted with a puzzling mystery: the murder of an already undead man. Most of the issue is devoted to building up atmosphere and setting. Artist I. N. J. Culbard and colorist Patricia Mulvihill work gorgeously together in the ligne clair/clear-line style, with smooth inking and planes of muted color that emphasize the setting’s eerie placidity and the script’s deliberate, brooding pace. A scene of Suttle walking into his almost entirely deserted office building, its many untenanted desks draped over with white sheets, and numerous shots of meticulously rendered architecture looming over sparse inhabitants, recall the trademark scenes of deserted London streets that opened 28 Days Later – this is just a century earlier. You can see a free 6-page preview of The New Deadwardians and a brief interview with Culbard here (source: L. A. Times – did you know they covered comics? I didn’t). 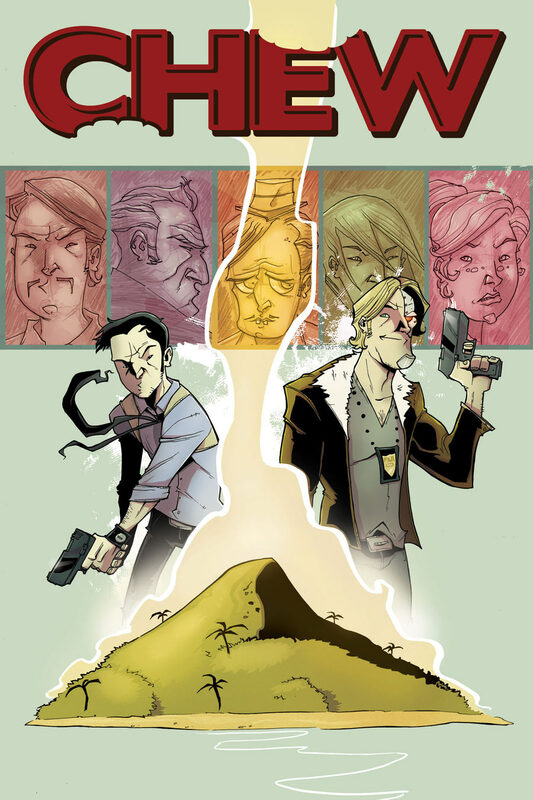 Chew is the story of Tony Chu, a humorless detective who has the unfortunate ability to gain psychic impressions from anything he eats (except beets). Recruited by the FDA – now the world’s most powerful law enforcement agency in the wake of an avian flu pandemic that took hundreds of millions of lives – for his singular talent, Tony finds himself taking bites of stranger and stranger substances as his casework, increasingly muddied by connections to shadowy criminal organizations and possibly extraterrestrial conspiracies, takes him from New York chicken speakeasies to Siberian research stations staffed by vampire ladies in ushankas to tropical dictator states. Add in a generously embarrassing family, an exhaustingly cheerful cyborg partner, and a hate-filled boss, and life just won’t let up on this by-the-rules cop. The plot is obviously going somewhere, but frankly I’ve been so distracted and entertained and perplexed by the moment-to-moment madness of each volume that I haven’t been working all that hard to piece the bits together – though the gathering momentum was obvious by the end of volume 3, and left me hoping for some interesting developments IN SPACE. I also have to single out Chew‘s creators for the fact that even though they make merry with pulp/genre stereotypes (well hello, melon-breasted Asian lady assassin, nice to roll my eyes at you again) and just-plain stereotypes (the female assassin is exaggerated to clearly satirical proportions; I’m far less comfortable with the fact that the only recurring black character in the series is, straighforwardly, a cowardly criminal), having gone for the Chew/Chu pun, Layman and Guillory obviously committed thereafter to representation of a varied cast of Asian characters. In other words, they didn’t let Tony’s ethnicity stay a one-off joke and then pat themselves on the back for being inclusive by way of one nonwhite protagonist. Which, frankly, I think plenty of other writers, especially in comics, would have done. I give them heaping points, of course, for having a cool, competent male Asian protagonist in the first place; discounting of Asian men in pop culture as comical, emasculated etc. (if they’re not ninja/samurai) is a major pet peeve of mine. (I did a count once of the number of female Asian superheroes [ooo, so exotic!!] vs. male once, and the ratio was pretty dismal.) But from there, numerous members of Tony’s family, immediate and extended, have also gotten plenty of pagetime, including his cheerfully self-aggrandizing chef brother and adorable, NASA-employee twin sister. Though character development takes second seat to conceptual and narrative whimsy in Chew, most of the characters are amply buoyed by the series’ manic energy and humor. It’s refreshing and gratifying to see a broad cast of Asian characters getting the same treatment, and adds immeasurably to my enjoyment of a series that already leaves me grinning at every turn. 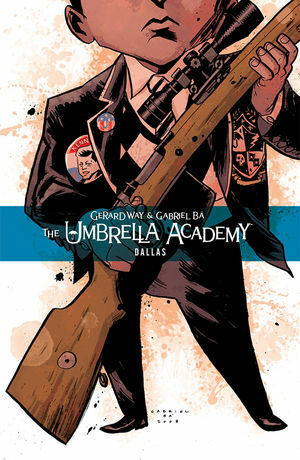 Umbrella Academy works off of the psychological model for superheroes that’s prevailed since Watchmen: they’re average human beings – willful, petty, self-absorbed – acting out their neuroses and capacity for brutality, both emotional and physical, on superhuman scales. Kraken is the series’ Rorschach, obsessed on a primal level with vigilanteism. Spaceboy began as (to jump comic universes) the moody, nobly pathetic X-Man, ashamed of his physical monstrosity (his head was grafted to a Martian gorilla’s body in a lifesaving operation at some point in the past), but by the beginning of this arc has gone over to Nite Owl – overweight, impotent, haunted by crumbling ideals of heroism. Spaceboy is an obvious visual manifestation of the jungle-beast metaphor: the superhero who’s at least as much monster as man, a Frankensteinian creation as cognitively dissonant and surreally comical as the intelligence-augmented chimps that now constitute a significant proportion of the world of the Umbrella Academy. The chimps were also experimental creations of the Academy’s founder, Sir Reginald Hargreeves, of course. The brief glimpses we get of frigid, controlling Hargreeves are some of the most disturbing moments of the series; it’s a wonder that the Umbrella kids, his grandest experiment, didn’t turn out even more dysfunctional. In the end, disaster is averted and the world is saved, but at the cost of the life of a good man, and further erosion of the tenuous bonds among the Umbrella Academy. I was pretty heartbroken by the end of the volume, especially after the emotionally devastating bonus story, “Anywhere But Here,” which reveals a pivotal moment from Vanya’s past. Way and Bá have taken their superheroes to such depths of despondency that it’s hard to imagine where they’ll go from here, but I trust that they’ll continue to unfold their heroes’ fates with style, wit, and humanity.